Music is a universal language, but the German that Bach uses in his sacred music is not. 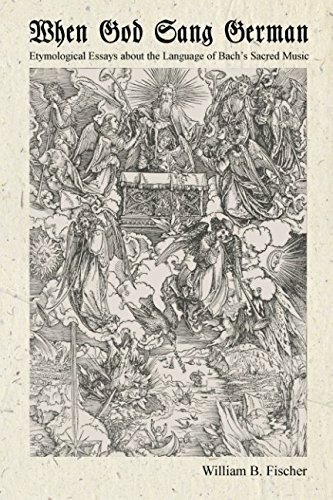 "When God Sang German" explains the etymologies and precise meanings of words like Gott (God), Mutterleib ('womb'), Schuld (debt, guilt), Glauben (faith, believe), and Gnade (mercy, grace). The Introduction traces the history of German, with particular regard to language in music and to Luther's importance to Bach. The thirty main chapters are each built on a theme, such as "Heaven and Earth" or "Pregnant, Inn, Manger". Special chapters describe Bach's alphabet (handwriting and fonts), vocabulary patterns (such as words for vocal tract sounds), grammar (differences between his German and modern German), and phonology. The author is a scholar of literature, language teacher, and experienced singer of Bach and opera. He has taught practical German to young opera singers, crawled through the rafters of the Thomaskirche in Leipzig, and been chained behind an elephant as an Ethiopian POW in Aïda. EXCERPTS Chapter 1: At Christmastide we sing about the God who becomes a Child. An odd grammatical similarity between the two German words, Gott and Kind, shines a linguistic light onto the beliefs of Bach's pre-Christian ancestors. Both words form their plural with -er: Kinder, Götter. So do other biblical and barnyard words, especially the terms for the young of animals: Lamm, lamb (plural Lämmer); Kalb, calf (Kälber). These nouns, including Kind, are neuter in gender – except Gott. Modern German is der Gott, masculine. The linguistic ancestors of Gott and God, however, were indeed neuter in gender, both grammatically and in the physiological gender that the "heathens" ascribed to some of their gods. The meaning of the word that descended from the Proto-Germanic root word *guða- was transferred to the Christian Deity. Initially the word remained neuter. The shift to masculine gender occurred as the new religion gained adherents and territory in northern Europe. But by Bach's time no one would have given any thought to what the plural of Gott says about its earlier gender and meaning. Chapter 7: The Nativity story, as recorded in Luke and cited by Bach, tells how the angel gave Jesus that name "ehe denn er im Mutterleibe empfangen ward", "before he was conceived in the womb". Where English womb is not closely related to any other word, Mutterleib is built from two transparent parts: Mutter, mother, and Leib, body. Any German-speaking kindergartner can sense what the word means, at least at the level of "mommy’s tummy", which at that age is quite sufficient. Mutterleib is prominent in Bach, not only in the "Christmas Oratorio", but also in his often-performed settings of "Nun danket alle Gott", "Now Thank We All Our God", one of the best-known of German hymns (BWV 79, 120a, 192, 252, 386). The first verse sings of a God who has done great things for us "Von Mutterleib und Kindesbeinen an", "from when we were still in…" – well, what, in a concert-program translation? "Uterus", obviously, will not ring true. Ordinarily, "womb" would work, as it does in the Luke verse. But the worshipers in the hymn are singing in the plural. One version sidesteps with "our mothers' arms"; another goes boldly with "our mothers' wombs". The idiom paired with Mutterleib, "[von] Kindesbeinen an", is literally "from our child-legs on". Its common English equivalent is "from when we were knee-high to a grasshopper". Afterword: Could Bach have learned anything from "When God Sang German"? Yes. The first systematic work in Indo-European and Germanic philology was undertaken only well after his time. He would have stood amazed at the notion that the Sanskrit word samulyam, '(bridal) garment', provides a key link among German Hemd, 'shirt', French chemise, also 'shirt', and Leichnam, 'corpse'. The common source is the Proto-Indo-European root *kem-, 'cover, conceal, which also produced German Scham and Himmel and their English cousins shame and heaven.